We have put together a great collection of recipes for English Tea Sandwiches or Tea Sandwich Recipes. You will find some classics as well as a few twists. Tea Sandwiches are traditionally served with high tea and afternoon tea, but you can really serve them for any occassion. These yummy little tea sandwich recipes will be the talk of your next tea party or gathering. While they may take a little bit of time to create, these tea party sandwiches are worth every bit of effort. Each of these tea party sandwich recipes will open in a new window. Some of them are amazing, and recipes for a tea party are always great to have on hand. Tea Party Sandwich Tips & Tricks – These are some great tips and tricks to make perfect tea party sandwiches every time. From keeping them fresh, preparing the bread, and storing. This is a must read page if you are considering making tea sandwiches. English High Tea Recipes – There are some great traditional tea sandwich recipes on this site. Poppy seed, radishes, watercress and cucumber are just of few of the ingredients you will find in the different English Tea Sandwich Recipes on this site. Afternoon Tea Party Recipes – Join in and try some of these excellent Tea Sandwich Recipes and Tea Party Menu Treats!. Devonshire Cream, Scones, Biscuits and more. Victorian Tea Party Menu – This is a traditional Victorian Tea Party Menu – and all the recipes to go with the tea party menu items. Cherries Jubilee, Tea Sandwich Recipes, and lots more. No time to plan your tea party menu, this is all ready to go! What would a tea party be without those tiny tea party sandwiches! They have always been one of my favorite parts of a tea party and what I looked forward to the most. There are different tea-party sandwich fillings, but there are some tricks to making the sandwiches. I was fortunate enough to be around some very talented tea party experts, who could create these sandwiches with no trouble at all. I was always saddened that the only time these sandwiches were served was with an afternoon tea! They really are a treat. It seems not too many people take the time to make their sandwiches for an afternoon tea any more. Too bad – if you can make the time, they are really worth the effort. If not, you can always look up some one who specializes in catering tea parties for help. Here are the tips to make a great sandwich, regardless of the filling. This is KEY! You must find a grocer who makes the square white bread in long loaves. Once you have found him, ask him to cut the bread length wise instead of vertically for you. This will make your life much easier! Working with your Bread Now that you have your bread, you must remove the crusts. Once that is done, you can begin. Regardless of your filling, you want to work with the bread flattened, do this with a rolling pin. Rolling the Sandwich Once you have applied the filling to the entire bread surface, you are ready to roll! Roll long ways and you will have a nice long sandwich roll. Keeping the Tea Sandwiches Fresh This is a trick I learned a long time ago. Once the sandwich is rolled, wrap the sandwich in a very lightly damped tea towel. Then wrap the entire roll in wax paper and tightly seal the ends by twisting them. Now put your sandwich roll in the fridge until you are ready to slice and serve. These are the tricks to make the sandwiches just perfect! I hope you find this information useful. Sun Tea Recipe – How To Make Sun Tea! Our Sun Tea Recipe is the best on the web and we want to share how to make Sun Tea with you. Making Sun Tea is a really great activity for those who are enjoying those long summer days! When it’s too hot to boil the kettle and heat up the kitchen, you can always have a little fun and make some great sun tea with the power of the sun, a sun tea jar, and your favorite tea. Traditional Sun Tea is just that, tea that has been left to steep in a sun tea jar in the hot sun for several hours. 3-5 hours is about average, and you can ajust this based on the intensity of the sun. It is really easy to do! You will need a large sun tea jar or container. It is really important that your sun tea jar is glass if possible. The container needs to hold 8 cups of water. Plastic sun tea jars are not recommended. 4-6 of your favorite Tea Bags, green and black tea work best, but you can use any tea bag you like, including herbal teas. Place the water and the tea bags in the sun tea jar, place on the lid and leave in the Sun to brew and steep for 3-6 hours. You will know your tea is ready when the colour has reached the colour of tea as if it was brewed in a tea pot with boiling water. Sun Tea tends to be a bit milder tasting than normal brewed tea. Serve the tea over ice, or drink warm. You can sweeten to taste and a few wedges of lemon make a yummy drink on a lazy summer day.- Homemade Iced Sun Tea!! You can see that you could almost walk about the garden and see what is available and make your tea! Dandelion Tea, raspberry leaf tea, and parsley tea are also really popular herbal teas that are easily made into Sun Tea. So have some fun and try making some Sun Tea today! You can pick up inexpensive sun tea jars and containers at your local dollar store, or walmart. You can also ask your local deli if they have any of those big glass jars that pickles and deli eggs come in – those jars work perfect. Just remember, your sun tea jar needs to be glass, no plastics. To make your tea party really special, think about creating unique tea party centerpieces that go with the theme of your party! 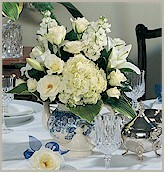 Tea Party Ideas for centerpieces and decorations to help you plan your next tea party with style and grace! 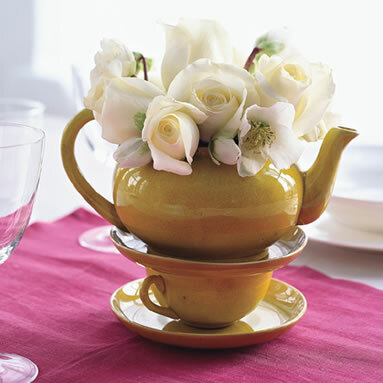 You can get really creative with tea cups and tea pots as your centerpiece – especially if you are looking for a flower centerpiece. In the photo above, the tea pot is carefully balance and the tea cup! Probably not the best idea if little ones are around, but it is striking. Also quite inexpensive to create! Just find a matching tea pot and tea cup and saucer and then a few flowers to top it all off. The white roses in the mustard colored tea pot really set it off. Try to stick with one colour of flower especially if the tea pot you use is patterned. Lillie’s work really well too, and one large Lilly will fill your whole tea pot! If your teapot is a single colour, don’t be afraid to go out to the garden and pick an assortment of flowers to create some garden wimsey for your table! You can do lots of other centerpieces as well for your special tea party! Teddy Bear Tea Party – Just find a cute teddy bear, and get some balloons. Place your bear in the middle of the table on a beautiful china serving platter and tie the balloons to the bears paw! It is really cute! Tea Party Tower Centerpiece Scrounge around some thrift and second hand stores and find and assortment of tea cups and saucers. Find a fancy serving plate too! I recommend only 4 or 5 tea cups and saucers. Build a tower, gluing (use crazy glue!) the cups and saucers into a tower. You can make this a crazy tower by skewing the center of each tea cup and sacuer! Don’t build it too high, it wil topple on you. I hope you liked these tea party center-piece ideas! Goldenseal, also known as Orangeroot is in the Buttercup family of perennial herbs and is native to North America. Growing Goldenseal can be done in various parts of the world and is a nice addition to the herb garden. Goldenseal is known for its golden colored knotted root and purplish stem which produces small greenish flowers and a single large berry that resembles a raspberry. Goldenseal is often used in herbal remedies of many kinds including a mix with Echinacea for its virus fighting abilities. Goldenseal is often found with other herbals due to its ability to boost the medicinal value in other herbs. Chinese Goldenseal is also of the same family. Due to its popularity in medicinal uses, Wild Goldenseal is among the endangered herbs as it has been harvested without being replenished. Organic Goldenseal is generally farmed and harvested with eco sensitive methods. If you are going to use Goldenseal and you are not able to grow your own, try to find the organic variety. In the folklore of Goldenseal it is said that taking supplements of Goldenseal will conceal the use of drugs such as morphine and cocaine in urine tests. This however has been shown to be untrue and Goldenseal for this use was probably confused with another more dangerous herb. Goldenseal tea is prepared by simmering 1 teaspoon dried root in 8 ounces of boiling water for 10 – 20 minutes. Goldenseal tea can be used as an eye wash. Strong Goldenseal tea can be used as a douche to treat yeast infections in women. Gargling with Goldenseal tea is said to heal canker soars in the mouth and ease soar throats. Mixing Goldenseal with other herbal teas can boost the medicinal value of other herbs. It is an excellent additive to most herbal teas to increase the medicinal properties of the other herbs. Taking Goldenseal for an excessive length of time can reduce the absorption of vitamin B in the body. Goldenseal may decrease the effectiveness of anti-clotting drugs and cautions should be taken if you are currently taking drugs such as Heparin or Coumadin. Goldenseal should be avoided during pregnancy and breastfeeding. Tea herbs are an exciting way to spice up any cup of tea. You can add herbs to green tea, white tea, black tea… you get the idea. You can also blend herbs together to create custom and gourment tea blends. It is a fascinating art to be able to custom blend a herbal tea and use them for herbal remedies and natural or homeopathic remedies. We have a great resource we put together listing over 100 herbs that are all used to treat different conditions and ailments and enhance the flavor of any cup of tea. I have some personal favorites when it comes to herbal tea. Peppermint, ginger for a little bite and pick me up, and chamomile to sooth away the days stress. But there are 100’s of herbs you can use to make herbal tea. Here is our herb data base where you will find all kinds of information about the different herbs used for tea and a recipe for each one. Herbs like lavender, basil, rosemary, and calendula or marigold can be grown in most gardens or a patio pot. If you do a little research, you can create a unique and inspiring tea garden for yourself. 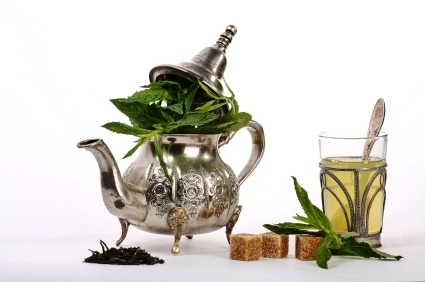 Peppermint and spearmint are excellent herbal teas, and easily grown in a pot and placed in the sun. You can also forage for wildcrafted (grown in the wild) herbs that make wonderful teas. Dandelions, red clover blossom and stinging nettle all come to mind when I am taking a walk and I often come home with some wonderful herbal tea ingredients. All around us are these magnificent herbs that can easily and quickly be made into a herbal tea or herbal rememdy. It is easy in todays busy world to loose track and forget that some of the most nutritious and beneficial things from our body can be ingested with incorporating herbs into our diets and tea. Lots of people email us about Ma huang tea, where to buy ma huang and ephedra ma huang information. Ma huang is a chinese herb that has been used for 1000’s of years. Today it is often found as ma huang diet pills, ma huang supplements, ma huang extract and as ma huang tea. Ephedra (ma huang) is now illegal in many US States. It has been linked to medical problems. Ephedra ma huang stimulates the heart, respitory system, and lungs with a stimulant it contains called ephedrine. Ephedra (ma huang) is not safe taken in high doseages, over prolonged periods of time, or with other stimulants such as coffee or caffeine beverages. Ma huang has been linked to heart attacks, seizures, high blood pressure, black outs and even death. If you are considering ma huang for a diet or as a stimulant, please excercise caution, it can be very dangerous if miss used. Chinese ma huang is a safe herb if used with caution, and you watch for signs. Increased heart rate, sweating, and jitters are signs you have had too much. Chinese herbalists have used ma huang to treat several chronic conditions such as asthma, bronchial infections and as a diuretic. Ma huang is mostly used for its diuretic and weight loss abilities today in North America. Here is the basic recipe for making ma huang herbal tea. It is often used as a diet supplement, and is very effective at helping increase metabolism and burn fat. The recipe is easy, and do not increase the herbal quantities. Let the ma huang herbal tea steep for 10 minutes. Strain and enjoy. In my opinion, drinking tea for relaxation should be a daily part of life for every person on Earth. Although tea is known for its amazing health qualities, the relaxation benefits are just as powerful! Unfortunately, stress has become a major part of modern-day life. The majority of people don’t even understand the meaning of relaxation anymore. Your body was meant to relax periodically, but as time goes on more and more people are pushing their bodies to the limits – therefore decreasing their life expectancy. Stress is a major cause of things such as obesity, heart problems, strokes, high blood pressure, and dozens of other health issues. What most people don’t understand is that these problems can easily be eliminated! In other pages I talk about how tea drinkers have a higher life expectancy than non-tea drinkers. I believe that fact comes from a few different factors. Of course tea has great health benefits, but it also has a unique ability to calm you down and relax your body. Although there are dozens of ways to relax your body and mind, drinking a cup of tea is one of my personal favorites. To spend 10 or 15 minutes drinking a cup of tea and physically relaxing your body is one of the best ways to end a long day at work. Is There A “Relaxation Tea”? Although any tea you drink is great for relaxing the mind and body, certain ones have characteristics that help the process. For example, out of the major groups of tea I would say green tea or white tea for relaxation is best. Why? Because they contain very low amounts of caffeine, so it doesn’t affect you very much. Herbal tea such as Chamomile, Peppermint, Spearmint, St. John’s Wort, Lemon Balm, and Kava Kava is great for relieving stress and anxiety. Something such as Valerian is a great stress reducer as well as an herb that will help insomniacs. Physical relaxation comes from tea in 2 ways. First involves the way in which certain chemicals in tea affect the way your brain tells your muscles to relax. I won’t get into the chemistry of it because it gets pretty complicated. The second is more of a metaphysical way in which it reacts to your body. This varies from person to person. Tea has been drunk for thousands of years and is the national drink for many countries. Some of these countries believe tea has a mystical power over the body and creates a type of energy which runs through and relaxes your body. As you can see, drinking tea for relaxation is nothing new – it’s been around for centuries! If you are a person who meditates and/or believes in things such as energy fields in your body that you can control through Qi-Qong or other methods, the second way might be of particular interest to you. If not, you’re still getting relaxes because of the chemical process that occurs in your brain. Parsley is a bright green herb used in American, Middle Eastern and European cuisine much like Coriander and Cilantro which are in the same family. Parsley herb is grown in 3 forms, curly leaf, and flat leaf and as a root vegetable that looks like Parsnip but tastes different. We offer high-quality Organic Parsley. Certified Organic Parsley Leaf & Parsley Root to make Parsley Tea. There are many health benefits associated with parsley. Wild cultivation of parsley is encouraged only in the curly leaf type as the flat leaf Parsley looks so similar to Poison Hemlock that it is often confused with it. Growing Parsley from seed is said to be difficult because of the long and difficult germination time and soaking the seed overnight before sowing will often lessen the germination time. There are several parsley health benefits that have been documented. Parsley has its place in the medicinal world and has been used traditionally to treat high blood pressure, bring menstruation and for urinary problems as well as treating mosquito bites when applied topically. It is a common health tonic and herbal remedy ingredient. Parsley tea is prepared by steeping 1 teaspoon dried herb or 2 tablespoons fresh herb in 8 ounces of boiling water for 10 minutes. You can read more about Parsley Tea here. Here are some of the benefits of parsley. Crushing Parsley leaves and rubbing them on the skin is thought to relieve itching due to insect bites. Parsley has been used to flush the kidneys of excess sodium and water and enable the body to better absorb potassium. Parsley seed has been used to treat rheumatism and arthritis. Parsley is thought to lower blood pressure. Parsley tea can be used as an enema. Medicinal use of Parsley is discouraged during pregnancy as it can cause miscarriage. The use of Parsley seed is discouraged during pregnancy or breastfeeding. Flat Parsley Leaf can easily be confused with Poison Hemlock, do not use if you are not 100% sure what you are using. Parsley Tea – Learn all about parsley herbal tea, health benefits of parsley, how to grow parsley and tips on growing parsley and using it for herbal teas and health benefits. Parsley tea is used for a variety of reasons. The herb parsley is very beneficial and we will cover the health benefits of parsley, how to grow parsley, parsley uses, and provide a recipe for a parsley herbal tea. Parsley is most widely recognized as a garnish and as a spice for adding color and flavor to a variety of foods. Most people view parsley as just that, a garnish, and don’t realize the many health benefits associated with parsley. There are several different kinds of parsly. Curly parsley, flat leaf parsley, italian parsley etc. They are all part of the same family and have the same growing needs and uses. The benefits of parsley are far reaching, so we all need to incorporate more of this herb into our diet. It is very easy to grow, and here are some tips. Parsley is native to the Mediterranean, however it is now a widely cultivated herb. It is quite easy to grow parsley as long as you follow a few tips. It would be classed as an ‘easy to grow’ herb, not much skill required. Parsley is a biennial. Meaning that it will flower and go to seed in its second year in the garden, so you replant every 2nd year to continue to enjoy fresh home grown parsley all the time. It does well in a cool environment, and not in full sunlight in the hot days of summer. To ensure a good harvest of parsley, make sure the soil can retain moisture or mulch it well. 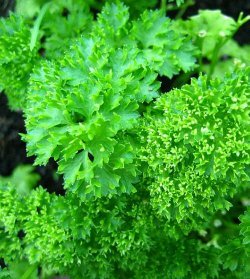 Parsley does not like dry sandy soil, but a rich, moist environment. If you are growing parsley from seed, it takes 3 weeks or longer to germinate, but parsley plants are usually available in your local garden center or nursery. Growing parsley is not limited to a garden and does well in pots as long as the soil is rich and can retain water. Prepare to water frequently if you use a clay pot as they tend to dry out the soil. Steep the parsley tea for up to 10 minutes. Your tea will take on a vibrant green color an is ready to drink. You can also use the parsley herbal tea to flavor dishes such as rice and potato dishes.